KickStart Cart.com **FREE Demo & Marketing Tools! "Tom, we just got our first $1,000.00 sale in KickStartCart. 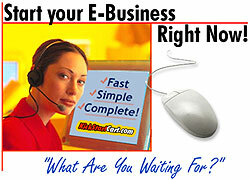 Both me and my dad are thrilled"
Do you have a product or service you would like to sell online? Do you want to tap into the BILLION DOLLAR MARKET of selling your goods and services online? Well, you've come to the right place! We have ALL THE TOOLS you need to succeed online! KickStartCart.com integrates everything you need to do business professionally over the Internet - an Internet merchant account, a payment gateway, a secure online order form, Affiliate tracking, ad tracking, detailed reporting, and much, much more. It's perfect for selling shippable products or downloadable goods or online services on a one-time or recurring basis. I'm Tom Antion. I have the largest electronic marketing operation in my industry. I have helped hundreds of people just like you learn how to make their Internet marketing business kick into gear. For several years the one thing I would never do was recommend a Shopping Cart to my clients. Everything out there, including the one I was using, was a pain in the neck and extremely difficult to use and work on. THAT'S ALL CHANGED BECAUSE OF KICKSTARTCART! SHOPPING CART - To COLLECT Orders! MERCHANT ACCOUNT - To PROCESS Orders! MARKETING TOOLS - To GENERATE MORE Orders! Instant Risk-Free ... 4-Week Test Drive! In just a few minutes from now, you can be ready for business! With KickStartCart.com, there is no software to buy or install. All you need to do is add a few "ADD TO CART" buttons from your web site to our secure server, and voila! You're in business! You don't have to make any changes in where your website is hosted. When customers buy, they simply click on "ADD TO CART/BUY ME" buttons or links. They then go to a secure order form hosted on our secure servers where they put in their credit card. Because installing an ecommerce system on your server is a supreme hassle. I know because I had to do it that way before KickStartCart was invented. It was a total nightmare. I had to have everything installed piece by piece by technical people who only wanted to blame other technical people when something didn't work. The system didn't have 1/100 the marketing power of KickStartCart, but caused 100 times the trouble to get all the separate pieces working. PLUS you get the secure server that is so important for your customer's safety included in the deal. It costs hundreds of dollars to get this yourself. Your customers enter their name, address, credit card number, etc. and click "submit." With your real time credit card gateway and merchant account it usually takes just two to three seconds for the money to start heading toward your checking account. If you're selling a shippable product like a tape, CD, book or T-shirt, the purchase is now complete and the customer is sent to your custom thank you page. An e-mail is automatically sent to both you and your customer confirming the deal. . . . Ship the product and you're that much richer. If you are selling a downloadable product like an e-book, once the credit card has been authorized, the customer downloads the e-book themselves. You get an email saying you made money. This is a thing of beauty. I've sold hundreds of thousands of dollars of e-books and hundreds of thousands of dollars for my clients who have KickStartCart. We didn't have to ship them, print them or pay for postage. KickStartCart even keeps the files on it's server so you don't have to eat up space on yours. "Tom, I'm doing $15.000 - $25,000.00 per month in e-book sales. The Upsell Module that I couldn't find anywhere else is responsible for at least 30% of this. KickStartCart.com provides you with a powerful and versatile shopping cart system loaded with all of the essential features you need to make your online venture a success! Many plain old shopping carts (I call them dumb cashiers) won't do anywhere near as much as this totally integrated shopping system (I call KickStartCart a "smart," automated, 24/7, professional sales force). Digital Products (i.e., eBooks, software, etc.) delivered in Seconds! Email Confirmations sent to Customers within Seconds of their Order! Supports Multiple Web Sites! . . . This can save you thousands of dollars. Electronic Coupons and Discount Modules Help to Increase Sales! Special Offer Module helps you sell more to the same number of customers. Delivers paid or free E-courses AUTOMATICALLY! Hooks up directly with UPS Shipping Tables in Real-Time! You can make changes yourself 24/7 . . . and it's easy! KickStartCart.com provides the tools both you and your customers need with the competitive advantage you also need in today's online eCommerce environment. "Tom, I'm becoming an autoresponder maniac. Your system is allowing me to automate my business with unlimited autoresponders and I'm doing it all myself (except for some occasional proofreading assistance) with your system. KickStartCart has so many features, I'm saving about $2,000 a year by not having to use additional programs." Once a customer buys one of your digital products KickStartCart eMails them download instructions and sends you an emails telling you that you just made money. The system not only takes the order and gets the credit card validated in real-time, but it also delivers a confirmation eMail and the product to the customer! How much more automated can you get? This feature alone is valued at $600 per year! "I'm getting rid of my antiquated shopping system and your free orientation showed me how fast I'll be able to do the transition. You saved me at least five hours trying to figure it out myself." Do you need to be able to take credit cards online from your customers? YES! Everyone knows, you must be able to offer credit card payment options to your customers. Credit card sales account for more than 80% of all online sales transactions. We have made the process to accept credit cards one of the easiest available on the Internet! 100% compatible ... with KickStartCart. One of the Lowest Prices ... on the Internet. 99% Approval Rate ... with all applications! A bank issued merchant account is required for you to accept Visa, MasterCard, American Express and Discover. It's included! A payment gateway is required to process credit cards real-time at your website. This is what connects your shopping cart to your merchant account. You can not only process orders with our Shopping Cart, but you will also be able to take orders by phone, by fax, or in person. All you need is a web browser. You can be anywhere in the world with web access and take credit card purchases. There are No expensive card terminals or special paper. No special software to install onto your computer. Our pricing is extremely competitive and some of the lowest pricing found anywhere on the Net! Guaranteed timely setup: Once we receive your application, your account can be activated within 3 to 4 business days. Accept all major credit cards! You can also process checking account debit cards with the VISA and MasterCard logo. Technical support is available 24 hours a day, seven days a week by calling a dedicated customer service number that you will receive once you have established your account. Just a few short years ago it would have cost over $100,000.00 in custom programming to have all the tools below selling for you on your website. What are the marketing tools you need to succeed online? Where can you find them WITHOUT ADDITIONAL COST? Great questions ... "1" Answer = KickStartCart.com! AUTORESPONDERS: Communicate with your customers while you sleep. Service their need for information, training literature and more automatically via our powerful autoresponder email systems. UP-SELL MODULES: "Would you like fries with that?" Increase your sales revenues by offering your customers other products (for sale) automatically every time they buy! This marketing module is a winner and helps to increase sales! AD TRACKING TOOLS & STATISTICS: How do you know which ads work and which ones don't! You can't! Not unless you have KickStartCart.com's Ad Tracking Software! AFFILIATE SALES TRACKING SOFTWARE TOOLS: Need sales? Need marketing? An Affiliate Program is a marketing system that allows other people to sell your products and services from their web site for a percentage of every sale they make. Increase your sales and web site traffic by allowing others to work for you! To run your own affiliate program, you need software to track sales and statistics, organize affiliates and to generate commission reports. Problem is, other companies out there want to charge extra for this kind of software and service. In fact, when I built my first system I paid nearly $1000.00 just for this software alone and you get it included for free. EMAIL BROADCASTING CAPABILITIES: Send email messages and sales letters to your entire customer, prospect or affiliate database of clients! This built in email broadcasting module allows you to send out any number of email messages to any number of recipients! And the fancy mail merge feature is included. This means each email is customized with the customer's name and just about anything else you want to put in. MAILING LIST PROGRAMS: Keep in touch with your customer - offer them the opt-in ability to sign up for one of your newsletters! Generate any number of different kinds of online newsletters, then send them out to clients, prospects and affiliates alike! POP-UP WIZARD: Grab your customer's attention to generate revenue and interest in something special you wish to offer them the second they come to your web site! You can generate your own popup window messages in a matter of seconds with our popup wizard software. Use it to load your questionnaire form to get your users to join your mailing list so you can send them follow ups, weeks, even months after their initial visit to your site. Use it to promote other people's products and services so you can earn money from these referrals. Use it to inspire your users to buy a special offer you have. QUESTIONNAIRE FEATURES: Want to know what your customers' interests are? Ask them! We include the software for you to be able to generate custom questionnaires for you to ask customers, prospects and affiliates alike a number of key questions, helping you to make the sale, close the sale or perform general or advanced market research. TELL-A-FRIEND: In a recent survey of over 58,000 people, 81% of respondents said they would recommend a web site they liked to their friends and associates ... Our TELL-A-FRIEND software allows your customers to do just that from your web site! Ready to install, simply copy and paste! All these features are built-in and designed to help you attract, generate and secure the interests and orders of prospects, clients and affiliates! I can't tell you how bad I wish I would have had this when I first started my web business. Even if you have an expensive old system like I had it's worth it to scrap the old that's not making you money and bring in the new that will. It makes absolutely no sense to keep an old system with no selling features just because you spent lots of money on it. It will keep costing you money . . . lots of money in lost sales each day you have it. With all these great benefits and features to run your new online business, you're not alone. Our Customer Support Team is ready and available to help you with any question you have with your new account. Email us, call us ... we're here to help you. Our response is timely and on target with your needs every time. We also provide a comprehensive online manual to the our entire Shopping Cart/Marketing Module system for your use and access 24/7. Our computer systems reside on some of the fastest networks in our region. Because of the large amount of bandwidth and speed our systems possess, both you and your customers are able to access our member systems and shopping carts at greater speeds than our competitors. This assures the customer can place their order without delay or struggle. This also allows you to access your member account in record speed, make important changes or additions to your shopping cart and marketing system when needed! On the Internet, SPEED says it all! The faster you can get your work done inside the shopping cart and marketing module system, the more time you have to market your web site! KickStartCart.com has the speed you need to run your online business! In just a few minutes from now, you will be ready for business! Spare yourself the nightmare and SIGN-UP FOR *FREE* NOW! Plus, when you make your purchase of the system you get an hour orientation with me personally. Skip the hurdles, jump-start your business and enjoy a hands-free income with KickStartCart.com! Sign-up Today for our *FREE* No-Risk Demo! Tom Antion, the owner of KickStartCart is not only an Internet marketing expert, he's also an internationally known public speaker. His website on public speaking is a great resource for anyone looking to start their career as a speaker, or improve their current presentation skills. The website is filled with 100s of articles, tips and information on public speaking, as well as a great collection of resources and educational material. Don't forget to sign up for his ezine on public speaking. It's currently the largest ezine on public speaking, in the world! Need a website designed by a professional? Ilya Pozin runs a professional web site design company called Ciplex. Ilya has been studying under Tom Antion for over 8 years, and has put together a great company that services those who need professional websites with the Internet marketing touch. His Los Angeles professional web design company serves clients all over the world. If you're in need of a website, that not only looks great, but sells, Ciplex is the company for you. Click here and go through the Signup Process. Once you get your user ID and password, login and immediately upgrade to the paid account of your choice. Remember if you want to do ebooks, you'll need the pro version. Click here if you need an online merchant account that is fully compatible with KickStartCart. You'll be set up in a few days. If you already have a compatible gateway and merchant account, then skip this step. After you purchase, call to arrange your free hour phone orientation. In the continental USA call 1-800-448-6280, outside the USA call 1-301-459-0738. In the mean time, log in to your account and start exploring the user's guide. That's all you have to do to be on your way to a substantial online income.